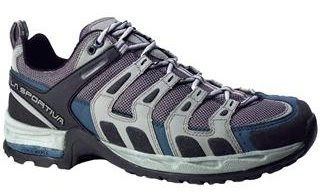 I’ve been guiding for about 25 years and am always on the look out for a better approach shoe. This class of shoe has its work cut out for it since it needs to hike comfortably AND climb well – at least on easy 5th class terrain. The La Sportiva Exum Pro’s I got at the beginning of the summer balance that equation incredibly well. I’ll admit that I’ve loved my La Sportiva Exum Ridge’s that I’ve been using for a couple of summers now and was a bit dubious about the idea that La Sportiva was tweaking them and giving them a new name: the Exum Pro. Like most of us, I don’t like change…especially when it comes to climbing apparel that works. Admittedly, me and my gray hair come from the school of ‘If it ain’t broke, don’t fix it!’ However, since La Sportiva had discontinued the Exum Ridge, and duct tape or shoe goo was no longer an option for my old stand-bys, I reluctantly (and with some unbecoming grumbling) ordered ‘the new guys’. Surprisingly, I’ve discovered that La Sportiva can teach an old dog new tricks – old approach shoes AND old guides! With the Exum Pro they’ve kept the ‘good’ and added some ‘better’ to it. They’ve added a softer feel to the Pro’s hiking comfort (almost like a running shoe!). The Exum Ridge was a bit harder with each step – something I’d learned to live with to get the climbing performance I wanted. Another added bonus of the Pro’s is their fit: a wee bit more relaxed. They are a hair wider in the toe box and a touch longer in the length which makes them even more comfortable on those steep descents. And climbing performance? The Pro climbs just as well as the Exum Ridge ever did. Bottom line: If you’re a fan of the Exum Ridge then you’ll love the Exum Pro. If you haven’t tried either then this is one approach shoe that comes highly recommended from an old dog still learning new tricks. Even for those who are not as internet-savvy, it is easy to use an open CMS for your daily tasks. I was facing addiction and wanted to go to a wilderness treatment center. These guys are the best and the really know how to help a person grow. If you live in the socal area you should consider California treatment help is out there. Then you should check these guys out. If you are looking for info on a eating disorder treatment then you need to do research and find the one that works for you. Thanks for the post. When I sold my BMW I was really nervous about finding good motorcycle shipping. No need to worry! These guys are the best. Great technology post, thanks. I found some whole house automation that were better than most! Being a bad faith attorney I found this article to be very informative. Help is out there and it’s easier to find if you know what you’re looking for. If you live in the socal area you should consider getting help for heroin addiction with care and compassion. When I needed to work with a company that was a Microsoft CRM Training. Then I knew that I had found software company that means business. If you’re looking for online clothing stores for juniors then this is the place to check out. Thanks for the info. Dealing with addiction can be hard and you should have an intervention for people you love when they need the extra help. Great info, thanks for posting. If you’re looking for provider based billing info then these might be the guys to help you out. Thanks for the post. I heard about visalus protein shakes but, didn’t believe it until I tried it. Great info, thanks for posting. If you’re looking for a really for info on affordable rehab centers then these might be the guys to help you out.